Opioids are in the news a lot lately because of the national epidemic of misuse and addiction involving these powerful painkillers and street drugs. So, some patients may understandably feel uneasy about taking prescription opioids to control their cancer pain—despite the fact that opioids are often the most effective choice for managing cancer-related pain. 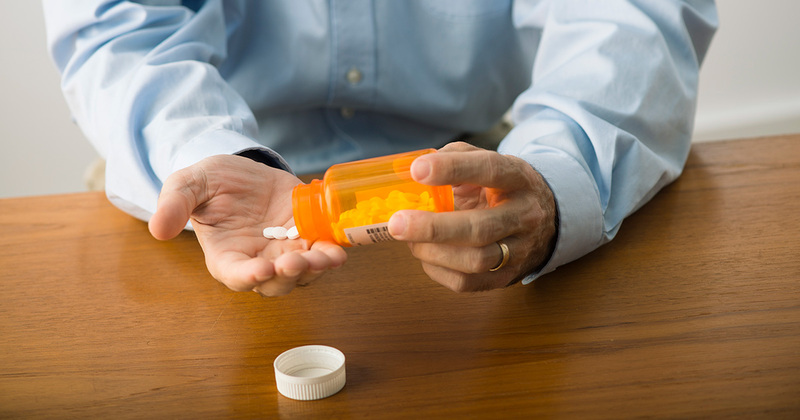 We asked Marcin Chwistek, MD, FAAHPM, and Molly E. Collins, MD, two palliative care specialists at Fox Chase Cancer Center, to discuss opioid safety and highlight other options for managing pain caused by cancer or its treatment. Prescription opioids can be a good option when cancer patients have moderate to severe pain. They are even used sometimes to treat ongoing pain in cancer survivors. The severity of a person’s pain and what’s causing it will dictate whether a doctor recommends an opioid. A variety of non-medical therapies might be considered for mild pain—they can also be used in conjunction with pain meds for moderate or severe pain. These include relaxation techniques (such as meditation or deep breathing), massage, acupuncture, distraction techniques (such as humor, prayer or music), and hot or cold packs. Physical therapy and exercise can also help improve pain, Chwistek said. "Exercise alone can positively impact the fatigue and pain a patient may experience." And counseling by mental health professionals and through support groups can be helpful as well. "Anything that helps you manage the pain on your own, I think, is incredibly important,” Chwistek said. If your doctor does recommend a prescription opioid, it’s because the medication is the best option for managing your particular pain. Your health care team will monitor your use of the drugs, especially if you have a history of substance use issues. “We’re using these medications to help you get into your life—not escape your life—and do the things that you want to be able to do,” said Molly E. Collins, MD, director of medical education in the Pain and Palliative Care Program at Fox Chase. Still, it’s important to discuss with your doctor any concerns about opioids you may have. To help ensure your safety, your doctor will assess your risks for developing addiction before prescribing an opioid. And you’ll receive exact instructions for how to safely take the medication. Following those instructions is extremely important. Let your doctor know if you take other medicines or drink alcohol. Combining opioids with alcohol or other medications that make you sleepy can cause their affects to be accentuated. Tell your doctor if your opioid isn’t helping or if it’s causing any side effects, such as constipation, sleepiness, nausea, or confusion. Some side effects last only a few days. Others can be managed effectively—if your doctor is aware. Ask your doctor how to taper off an opioid slowly. If you suddenly stop taking an opioid, you could experience withdrawal symptoms. But this doesn’t mean you are addicted to the medication. Not everyone with cancer will have pain. But it’s good to know about pain management options should you need them. In fact, pain control is just one of the ways the Pain and Palliative Care Program at Fox Chase helps people with cancer and their families. The doctors, nurses, and social workers on the palliative care team work together to help relieve both the physical side effects, and the emotional stress of cancer and its treatments. “We try to help cancer patients improve their quality of life by any measures that we can,” Chwistek said. You can read more about pain and palliative care at Fox Chase.